The wedding planning is in full swing – we have booked the Church and have decided to host a traditional Chinese wedding banquet for the reception. 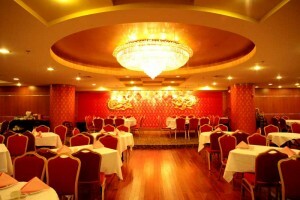 The options for a large banquet are few: China Pearl, Emperor’s Garden and Hei La Moon. Emperor’s Garden still looks like a dilapidated old theater that smells of urine, so that was out. 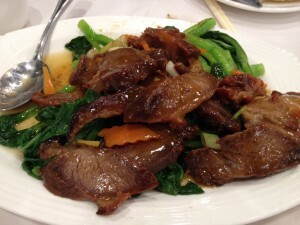 I have been to China Pearl dozens of times through the years, but I’ve never tried Hei La Moon, despite all the great reviews. Steve and I stopped by for dinner to check it out. I was a little concerned that the restaurant was completely empty, even if it was 8:30pm on a Monday evening. 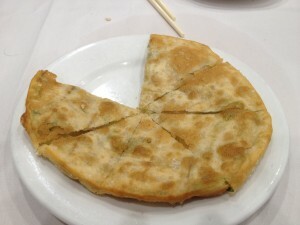 We started with Steve’s favorite, scallion pancakes. He informed me that if the pancakes weren’t good, we couldn’t have our wedding there. Luckily, they passed the test. They were light and crispy, although I thought it could have used more scallions. 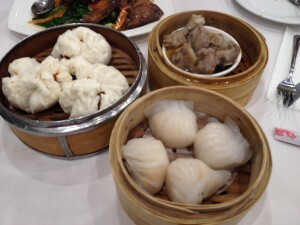 Steve had the roast pork with vegetables and I was delighted to find out that they offer dim sum to order in the evening, so I got steamed BBQ pork buns, spareribs, har gau and shumai. The shrimp in the har gau was plump and tasty, but the wrapper was thicker than I like. The spareribs and buns were perfunctory, but good. 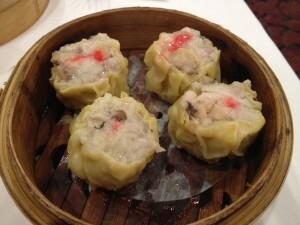 The shumai was the best out of the brunch. After dinner, we wandered to the downstairs space where our banquet would be. It is spacious enough to fit 300 people and a good sized dance floor. I envisioned our guests enjoying the 10-course meal and then dancing it off. I can’t wait.